Okay, so I know I didn’t need a new toy, guys. I know, but I happened to find a pretty darn good deal, and couldn’t pass it up. See, I’ve got my two sopranos – my darling little Kala KA-15S and the more mediocre Rubin RS-400L. And, there is a specific concert sized uke I’ve been eyeing, but, I’ve also had my mind set on a tenor. 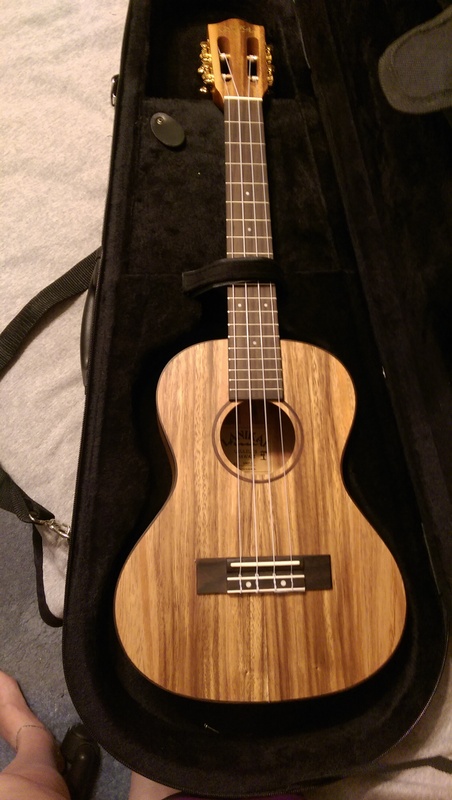 A tenor is actually a weirdly perfect transitional size between guitar and ukulele, but more than that, even before I picked up my very first uke, I knew I was eventually going to land on a tenor because they have this fuller sound than the smaller ukes that just is so very sweet. And, I’ve been thinking about and browsing for ideas for my first tenor, but had to keep things within a certain budget, so I was anticipating about $150 USD – give or take – being all I could really reasonably expect to afford at the moment, and figured that should be enough to get me a decent laminate. I thought, if I was very lucky, I would find something nice with a solid top in that price bracket. But, I knew I didn’t want mahogany again – not because there is anything at all wrong with mahogany or with laminates but that I feel at this point, if I’m making another purchase, it would be a good time to add some variety into the mix and start experimenting a little and getting my hands on some different woods or different laminates. I just wanted to choose something that was altogether different. 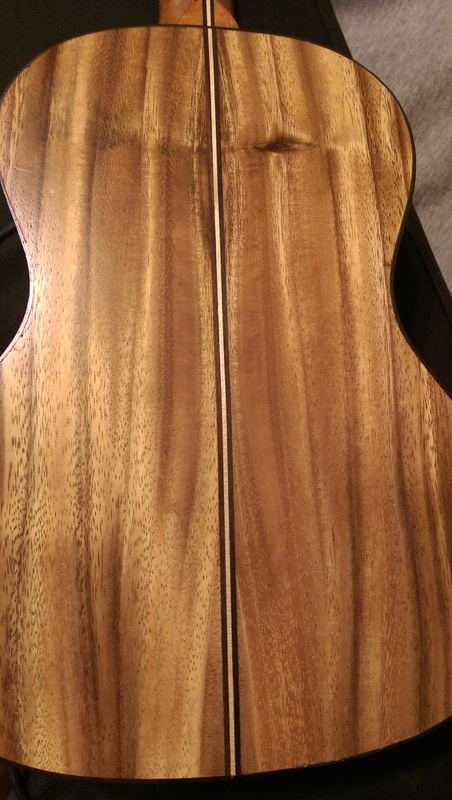 So, while I have nothing at all against mahogany, and while I love my Kala, those were two things I wanted to veer away from in this purchase, because I wanted to try a different wood, a different brand, ANYTHING different, to just experience other things. …and then, I stumbled across a refurbished deal on a Lanikai SMP-T. SOLD. I’d just sold my rogue dreadnought, so I had the bulk of what it was going to cost me sitting in my paypal account. The Lanikai SMP-T (solid monkey pod tenor) looks like it retails at about $300 USD, so double my budget. I know that’s what some would call cheap for a musical instrument, but it’s still too rich for my blood, seeing as I just spent that on a guitar not too long ago. But, the one I purchased was listed for $119 and included the hard shell case. There was a repaired crack in the back, but I wasn’t worried about a cosmetic flaw on the back of the uke, especially there, where no one but me would see it, provided it was solidly repaired. The seller had good reviews, and I saw nothing significant going on in the photos. I can’t afford it new, at all, but this was well within my anticipated budget, so I snapped it up. The repaired crack is so thin that my camera isn’t even picking it up, but it’s on the right side, for the record. The SMP-T features a solid monkey pod body, rosewood fingerboard and ovankol neck. Now, I’m hardly an ukulele pro, but what I do know for certain is that I did not think I would have a solid wood uke in my collection any time soon, so I’m really quite happy with it. So, I pulled out it, labeled the strings, and got right to restringing it for a lefty. (I’m getting to be old hat with this when it comes to ukes. lol.) My ukulele stringing skills are improving from all the practice, for sure. On my kala, I ended up clipping the strings at the bridge because I figured out too late when to tuck them under one another. This time around, I’d learned from my mistake. And, lucky me, I had some fretboard stickers left over from my guitar reconstructions, so I was able to mark off the frets on the side of the neck. Mostly, I just live without those markers when I restring a righty, but the silver dots I happen to have worked really nicely on this one. 1. The action is high. I honestly can’t speak to this. The action on mine is perfectly fine. That said, I purchased it refurbished, so it is entirely possible, and I would suspect likely, that someone already adjusted it. As mine stands, the action seems more or less the same as my Kala, so is perfectly low enough. 2. The neck is wide. I wasn’t overly worried about this as I’m also playing bass and guitar. but I was a bit concerned it would take me some acclimating to get used to the wider spaced strings. I really didn’t have anything to worry about. The tenor is quite different than the soprano, but I guess with fiddling with a guitar and bass in the mix, I may be becoming fairly flexible to that sort of thing. 3. The unfinished body is rough/sharp. No, it’s not. Sorry, there’s really no other way to word that. To be fair, I really don’t like that blinding gloss on instruments, and actually ruled out one of my top contenders in the tenor hunt because of it. Ohana makes a few that were in my price bracket, but when I looked them up, they weren’t just glossy, they were blindingly glossy. Some people like the gloss look. I just see a fingerprint magnet, and one that is going to be too satiny to get a comfortable grip without the use of a strap. Personal opinion? Totally. But, that doesn’t change the fact that I don’t find the uke either rough or overly pointy. The wood is unadorned because it doesn’t require adornments. There’s a simple beauty in that, I think: not adding unnecessary details to a wood that is attractive enough to stand on its own. As for the sound, I like it so far, but I don’t want to say too much about it until the strings stretch out. Right now, it’s still slipping out of tune, though after a few hours of noodling around with it, it’s already taking to the strings faster than the Rubin, so I think within the next few days I should be in good shape. PreviousMoving Subtly Forward…and more talk about my toys. NextSince I have an Ukulele Family now…let’s compare them.